Some time ago when attending a congress, I was confronted again with one of Covey's models. My holiday was a good moment to read Coveys bestselling book. Dr. Stephen R. Covey is an organization advisor in Provo, Utah and the director of FranklinCovey. 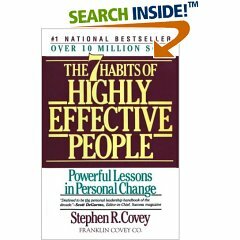 The 7 habits of Highly Effective People is Covey's bestselling book (15 million copies sold worldwide). Each of these habits are of course well known and nothing new. Still, Covey's book is very inspiring and certainly worth reading (while on some points somewhat religious, as Mr. Covey is a very religious man). The seven habits are described extensively and Covey points out why it is important to develop your own 7 habits further. The book contains many figures and models (like the famous circle of influence). The power of the book is in the excellent examples and the way it inspires you to take action on the seven habits described.